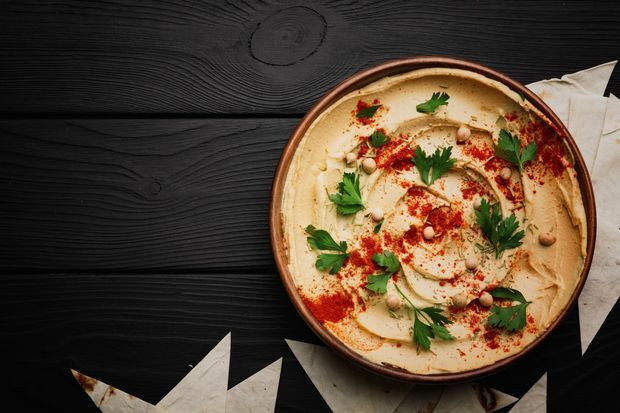 City schools now offer hummus as a lunch entree option for schools that request it. BROOKLYN — Goodbye, sloppy Joe's — unless they are made with lentils. Sunset Park’s P.S. 1, the Bergen Elementary School, is Brooklyn’s first all-vegetarian school, according to the Coalition for Healthy School Food, a nonprofit that partnered with the Department of Education’s Office of SchoolFood on helping some schools transition to a plant-based diet. P.S. 1 is the third public school in the city to adopt a vegetarian menu, joining Flushing’s P.S. 244, known as the Active Learning Elementary School, and Lower Manhattan’s P.S. 343, the Peck Slip School. The move to go vegetarian at the pre-K through fifth-grade school with more than 1,250 kids was student-driven, principal Arlene Ramos said. Several other schools have expressed interest in switching to the vegetarian menu, according to Amie Hamlin, executive director of the Coalition for Healthy Food. Hamlin was also pleased that roughly 1,200 cafeterias serving 1,800 city schools are now able to offer a daily vegan entrée of hummus, the popular chick pea dip — but they have to request it, Department of Education officials noted. That means kids could have a second vegan choice in addition to peanut butter and jelly. The vegetarian schools have several other vegan options, including lentil sloppy Joes, pasta fagioli, Mexicali chili, braised black beans with plantains, and teriyaki crunchy tofu. Beyond the vegetarian and vegan initiatives, the city’s school food system now offers anti-biotic free chicken and is incorporating more and more local foods, including local hamburgers. City schools now celebrate the bounty from New York farms on “NY Thursdays,” which feature locally grown or produced foods. The city has a chance to enhance its offering from nearby farmers, as the state Tuesday announced a request for proposals for farm-to-school programs, setting aside $1 million to support the growth of such initiatives across the state. The program, launched in 2015, aims to connect schools to local farmers and educate young people about agriculture. "New York will continue to provide funding to help schools build relationships with local farmers, instill good eating habits in our children, and support the state's agricultural industry," Gov. Andrew Cuomo said in a statement.